Think of Monday morning. Does the employee look forward to going to work or have the ‘Monday morning blues’? When friends and family ask: ‘how’s your job’? what are the responses? Engaged employees who enjoy their work experiences will always be happy and positive. Think of Monday morning. Does senior management look forward to working with their employees? Are there positive team meetings planned? Or remedial one-2-ones on the cards? Are business objectives being met? Senior management who have ensured employees are actively and positively focussed will rest assured all is well in hand. Common purpose: employees and business leaders must truly understand the business objectives and how each person contributes to that. Communication: employees and business leaders must speak the same language and clearly understand what is being said and done. An ideal workplace: let’s face it there really is no ideal workplace. However, input into making it as fun as possible should be given by all and appropriate changes made. All for one and one for all: I’m talking about teamwork. Teams enable closer working relationships, allow for collective risk taking, mistake making & learning which stimulate collective imagination developing new possibilities. Recognition and development: individual and the team must feel appreciated, empowered and supported. Especially when looking at longer term working relationships. Is it the responsibility of senior management to ensure their employees are engaged and enjoy a good working experience, both day-2-day and longer term? ABSOLUTELY YES! 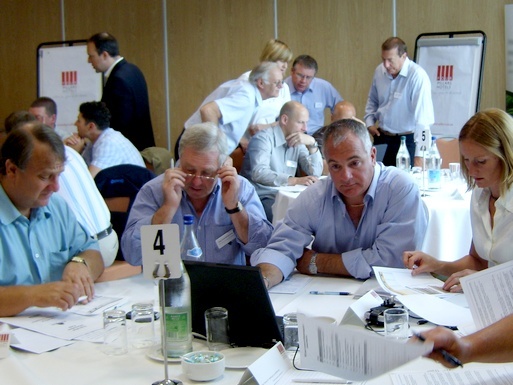 So how can this be done – engage in a business simulation! What? Why? How? Where? When? That is completely up to you – the senior manager. To find out more have a look at this short video or download this white paper.